On Feb. 12, 2008, at E. O. Green Junior High in Oxnard, CA, 14-year-old Brandon McInerney shot and killed his classmate, Larry King, who had recently begun to call himself “Leticia” and wear makeup and jewelry to school. New York Author and psychologist Ken Corbett was disturbed and intrigued by the case. So much so he delved deep into the issues of gender norms and traveled to California to follow the case and attend the court appearances of King. Larry King was also black and his killer was from an extremely violent background and had emerging Neo-nazi ideas. The issues facing LGBTI people have never been more in th public arena. People who may never have had any reason – or care – to know about issues of gender are now able to know about the human rights and violence issues facing people who identify as LGBTI. This book was interesting and disturbing. It’s a blend of true crime and a look at how society creates the breeding ground for a crime like this to happen. I’d recommend reading this article and interview with the author published in The Atlantic for more background. 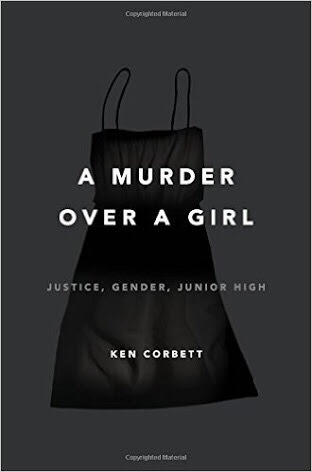 A Murder Over a Girl is published by Henry Holt and Company.